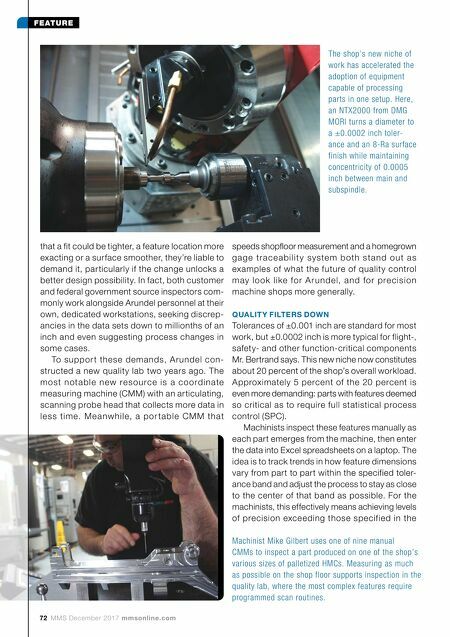 mmsonline.com December 2017 MMS 73 FEATURE design (for example, a tool change might occur earlier to keep a ±0.0005-inch feature within ±0.0003 inch instead). The rest of the shop's work may never call for SPC or such extreme precision. However, toler- ances are getting tighter in general, Mr. Shrader says. And judging from the testimony of machin- ists on the floor, improvements made and lessons learned on the most challenging jobs filter down to the rest of the mix. Moving for ward, these improvements and lessons will likely be even more important. Examples include: • Accelerated process development. The most difficult parts are most likely to challenge machin- ists to come up with new strategies, even for familiar geometries, says John Hebert, engineer- ing manager. For instance, surface finish require- ments might lead a familiar feature to be machined with a grinding wheel instead of the typical milling cutter. Other examples involve learning to make better use of the machine tools' single-setup production capabilities. For instance, he says the right strategy on a turn-mill can eliminate the need to leave "safety stock" on critical SPC features for removal later—in another setup, and possibly another machine—to ensure other operations don't affect the dimensions. • Accelerated technology investment. The shop invested in the first of these turn-mills and five-axis machines (mostly NT X series and DMU series machines from DMG MORI) about five years ago, before it had begun to consider customers' most sensitive work. However, the setup consolidation advantages that make these machines useful in a general sense are nothing less than essential for the new niche. SPC or no, these parts aren't suitable for lights-out production on the shop's lines of palletized HMCs. There's no room for the stackup error that comes with re-clamping, Mr. Hebert says, nor for potential difficulties in locat- ing features precisely relative to one another. "Tool wear in the one-tenth world is much different than in the one-thou world," Mr. Shrader says. Given these challenges, the new work has not only motivated the addition of more machines, but also helped to fund those investments. • Accelerated adoption of new technology. Amounting to more than $1.5 million in the past year alone, recent investments include more than just new machine tools. 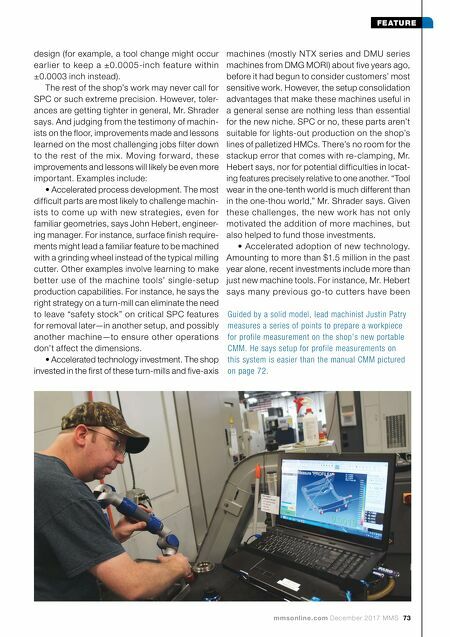 For instance, Mr. Hebert says many previous go-to cutters have been Guided by a solid model, lead machinist Justin Patry measures a series of points to prepare a workpiece for profile measurement on the shop's new portable CMM. He says setup for profile measurements on this system is easier than the manual CMM pictured on page 72.